Elsewhere, the Solomon Islands edged past their Melanesian rivals Vanuatu 1-0 to complete proceedings on the opening day at Port Moresby’s Sir John Guise Stadium. 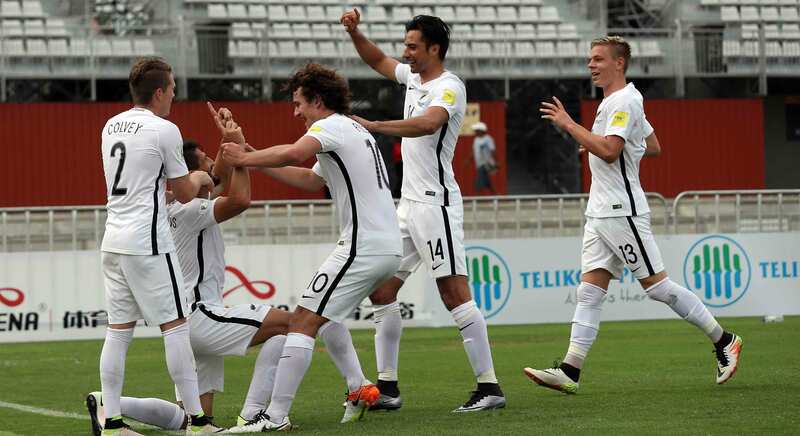 The All Whites went into their opening match against Fiji as hot favourites and it took them just 16 minutes to take the lead through Themistoklis Tzimopoulos. The opening goal came as a result of some good lead up play by New Zealand captain Chris Wood, who forced a reflex save from Fiji’s goalkeeper Simione Tamanisau, before Tzimopoulos tapped in the rebound. Led by Fiji captain Roy Krishna the Fijians tried to get back into the game but rarely tested All Whites keeper Stefan Marinovic. In the 41st minute New Zealand doubled their advantage courtesy of veteran striker Rory Fallon, who pounced on another close range rebound to make it 2-0. Fiji did manage to pull a goal back before the break following a foul on Setareki Hughes inside the penalty box. Captain Roy Krishna stepped up to convert from the penalty spot to end the first half at 2-1. New Zealand looked to control possession and territory in the second half and their patience payed dividends in the 61th minute when they were awarded a penalty for a handball Alvin Singh inside the box. Wood restored the All Whites two-goal cushion with a low shot that snuck past a diving Tamanisau. Fiji pushed forward looking to close the gap but the All Whites held firm to record a comfortable 3-1 win. New Zealand coach Anthony Hudson was satisfied with the result. Krishna says his side was unlucky not to get something out of the game. In the second match on the opening day, the Solomon Islands had to withstand an early onslaught by Vanuatu who seemed to be in total control in the opening 15 minutes. Pressing high up the field, Vanuatu striker Kensi Tangis looked particularly dangerous, causing plenty of problems to the Solomons’ defenders with his physical presence and movement. However for all their early dominance Vanuatu had nothing to show for, and they were made to pay in the 19th minute when the Bonitos took the lead courtesy of Jerry Donga, who chipped the ball over goalkeeper Seiloni Iaruel in a one-on-one situation inside the box. The goal seemed to have settled the nerves of the Solomon players who began to control possession and territory to hold onto their lead going into the break. The best chance of the second half fell to veteran Solomon Islands’ striker Benjamin Totori, whose shot from inside the box in the 69th minute looked to be heading for the target forcing an acrobatic diving save by Seloni Iaruel. In the final 20 minutes, Vanuatu tried to press forward searching for an equaliser, but couldn’t break down the Solomons defence. Winning coach Moses Toata Moses heaped praise on his players. The action at the 2016 OFC Nations Cup will continue on Sunday from 4pm local when tournament hosts Papua New Guinea face New Caledonia at Port Moresby’s Sir John Guise Stadium. Tahiti will begin their title defence against Group A rivals Samoa from 7pm.